It was 1982, the whole country was mesmerized and inspired by a young Canadian, named Terry Fox. My two sons and I laced up to run the Terry Fox 10K in Edmonton to show our support for Terry’s vision to find a cure and provide care for cancer victims. The fact that Terry was an amazing visionary, tenacious fundraiser, brilliant speaker and motivator was only eclipsed by the amazing athletic accomplishment of running a marathon each and every day, day after day. He did so on an archaic prosthetic, by today’s standards. This feat so inspired and motivated us all to help continue his dream. Running a 10K was frail and pale compared to Terry’s athleticism! 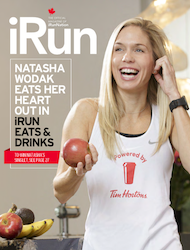 One of the foundations of the Running Room—and of races across Canada—is they all create a win for some charitable cause in the community. This too was started by Terry Fox. Terry was first an athlete and an amazing Canadian who would be proud of how Canada and the world have mobilized his dream. Canada as a country will be forever indebted to Terry Fox and the Fox family. I caught up with Fred Fox, Terry’s brother, ahead of our Marathon of Hope celebration on April 15, 2018. For more information on the event, please click here. Stanton: April, 1980. Terry started out on his iconic run. What do you remember about that day? Fox: I actually don’t remember much about the day other then the anticipation of watching the CBC news later in the day to see if there would be any coverage of Terry leaving St. John’s, NL. I remember more about the day Terry & his best friend Doug Alward left Vancouver airport. They left home April 7th and the departure was full of tears and uncertainty. No one knew, especially Terry, of what to expect once he arrived on the East Coast. Stanton: What were his spirits like? Fox: I would say Terry’s spirits were high, he was excited, but I’m sure at the same time, a bit nervous. Terry knew that he had done all of the hard work of training, to get his body prepared for running 42km’s or more a day. He was committed to his plan of running across Canada and was anxious to get started. Stanton: Could you ever imagine what it might become? Fox: No, not at all. I think in the beginning Terry could have only hoped his Marathon of Hope would have gained the attention that it had in the summer of 1980. By the time Terry was doing the bulk of his training in preparation to run across Canada, I wasn’t living at home anymore. I didn’t see Terry run any of those more then 5,000 training km’s. I saw him run for the first time while watching the 6 o’clock news. It wasn’t until I was able to run with Terry when he ran down University Avenue in Toronto, that I realized what his Marathon of Hope had become and the impact it was having on so many Canadians. Stanton: As he went across the country, the country came along with him. How did that change his spirits? Fox: I believe for the most part Terry’s spirits were always very good. Sure there were day’s early on when he’d arrive in a community and the local organizers had nothing planned. It disappointed him that he was working so hard, running everyday, that the effort on the other side might not have been happening. For Terry, it was all about raising money for cancer research, not about Terry Fox. When he felt that he was getting more attention then the purpose of his Marathon of Hope, it got him down a bit. His spirits were bolstered by knowing that the amount of money that was being raised was increasing. Stanton: It changed me, watching him run. And it changed running in this country. Do you see his impact in the sport of running today? Fox: Terry was an athlete, after being diagnosed with cancer and losing part of his right leg above the knee, taking chemotherapy and seeing others suffering and in pain, Terry decided he needed to do something. As an athlete, running is what he knew and decided that was going to be his way of making a difference. I don’t know what impact Terry’s running during his Marathon of Hope may have on running today. I meet people all of the time who are training for their first 10K race or marathon and when they are struggling, they think about Terry—he is their inspiration to continue. 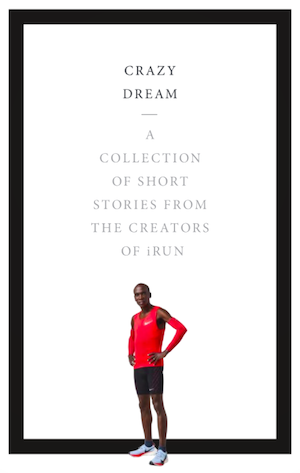 Stanton: What would you want today’s half marathon runners, marathon runners, 5Kers, all of us — to know about him? Fox: Terry was a hard worker, he didn’t believe in quitting. From the time he was a kid, he wasn’t the strongest, fastest or the best athlete in the group. But through perseverance and hard work, he accomplished many of the goals he set for himself. It was that way with his training and running. He took no short cuts, he worked through the challenges he faced. Stanton: “Even if I don’t finish, we need others to continue. It’s got to keep going without me,” he famously said. Tell us about your role in keeping his dream alive. Fox: From the beginning our family was supportive of what Terry was doing in 1980. When Terry passed away in June of 1981 after the cancer had returned to his lungs, it was our Mom (Betty) that was thrust out into the public eye to share Terry’s story. For over 30 years Mom worked hard to protect Terry’s values and the principles that he believed in, it wasn’t always easy, she faced many challenges to keep them intact. Now that both Mom & Dad are no longer with us, it’s up to my siblings, Judith, Darrell & I to continue where our Parents left off. In my role at The Terry Fox Foundation I have the wonderful opportunity to visit communities and schools across Canada to share Terry’s story and to thank many Canadians young and older that have been dedicated to keeping Terry’s dream alive. Stanton: What do you miss most about your brother? What should the world remember about how Terry lived? Fox: The things I miss about Terry most doesn’t have anything to do with his Marathon of Hope. I miss the things we did as kids, also the things we did after he was first diagnosed with cancer, playing golf and going to hockey games. Stanton: Last year, with the help of the Running Room, we crossed Canada over 8 times. Is there a message from you to the runners who join in the cause? Fox: Thank you, thank you for doing your part in keeping Terry’s dream and legacy alive. Terry said during his Marathon of Hope when explaining why he was running across Canada that we will all be touched by cancer. Maybe not personally, but maybe through a family member, friend or neighbour. That’s why he felt it was important to give to cancer research. Terry would say if you’ve given a dollar you are a part of the MOH. Terry’s request to raise funds is still as important today as it was in 1980. Stanton: Terry has done so much for cancer research, so much for Canada, and so much for our sport. What do you think Terry would make of how many people are now running? Fox: Terry loved sport, he was proud to be an athlete. Terry felt it was important to stay active for all of the health benefits that it provides. Terry ran cross country in high school. He ran to stay in shape for the other sports he played. When Terry started training with an artificial limb in February of 1979 in preparation for the Marathon of Hope, running in weekend 10k’s or half marathons, running was in it’s very early stages. Terry would be happy to know so many more people are running to stay healthy. Stanton: What did he love about the sport? Fox: Terry loved to compete. He may not have been the best on the team or best athlete, but he was always the one that worked the hardest. He loved the competitiveness of sport, but also the friendships it created. Stanton: Tell us about yourself lastly. What’s your involvement with the Foundation currently? How’s the family? Who else is involved? What are your plans for the year ahead, beyond? Fox: In my role at The Terry Fox Foundation I have the wonderful opportunity to visit communities and schools across Canada to share Terry’s story and to thank many Canadians, young and old, that have been dedicated to keeping Terry’s dream alive. I’m involved in reviewing requests that come in regarding Terry or events people want to create. Judith, Darrell & I are excited that our children, the next generation, are now getting more involved with how things work with the Terry Fox Foundation, their Grandma and Grandpa would be so proud. The Terry Fox Foundation is evolving and developing new opportunities to raise funds for cancer research. We have also starting to work on plans for the 40th anniversary. The TF Research Institute, where funds raised by TFF are distributed through are doing great things with treatment and collaborating with other research organizations. Terry and his family, including parents and siblings are all an inspiration. I want to thank them for being so strong, being so hard working and having so much hope in the face of heartbreaking challenges. I am so proud of them and happy they are Canadians. Their accomplishments as leaders are very special and above descriptive words. Their actions have impacted upon many. Great interview Fred and John. Kudos to the Running Room.